The power jack of the EM1206EV accepts "small" power connectors, 3.5mm in diameter. Use APR-P0011, APR-P0012, or APR-P0013 power adaptor supplied by Tibbo or a similar adaptor with 12V nominal output voltage. Adaptor current rating should be at least 500mA. On the power jack, the ground is "on the outside", as shown on the figure below. Alternatively, you can power the board through the Vin line on the expansion connector. 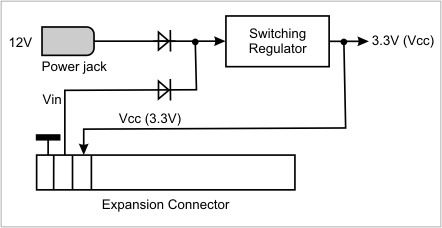 Two onboard diodes combine power jack and Vin inputs into a single line, which goes to the switching regulator. Clean 3.3V output produced by the regulator is used to power the EM1206EV board itself, the EM1206 module, and optionally an add-on board plugged into the wireless add-on connector. This 3.3V power is available on the expansion connector as well. The EM1206 module features an RTC and a dedicated VCCB input for providing backup power when the EM1206EV is off. On the EM1206EV, the backup power comes from a supercapacitor located on the bottom side of the board. The supercapacitor charges almost instantly and, in the absence of main power, supports the RTC for about a week. Notice that the supercapacitor is not connected to the Vcc line directly. The VCCB pin "expects" the backup power to have a nominal voltage of 2.5V. See the Real-time Counter topic of the EM1206 manual for details.